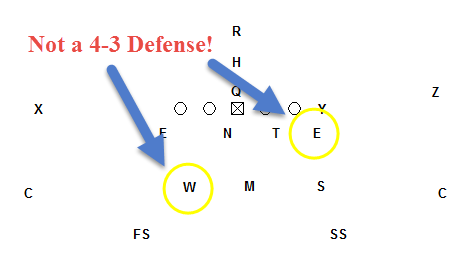 I sat down to write a little article about the 4-3 Defense. Clicked over to CoachHuey.com to get a few sparks of inspiration. And saw all kinds of discussion about defenses that are just not a 4-3 defense. I don’t want to split hairs. And I don’t care if you call your defense a 4-3 Defense or anything else. But I do want you to know the truth. The Miami 4-3 Defense, the one that has been the driving force behind a lot of great football teams… it’s not what I was reading about. This isn’t a CoachHuey bash, either. I learned the Miami 4-3 Defense by listening to a lot of good coaches on that site (4-3 Over Front is the same thing, by the way). This is just a public service announcement. A little rant from a coach who wants the 4-3 Defense to look like it used to. Like it should. 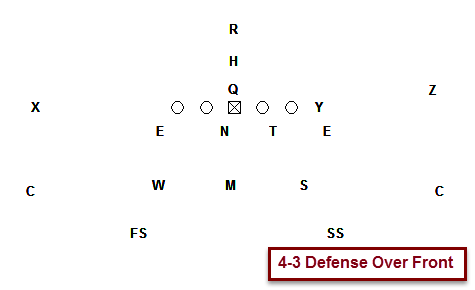 The 4-3 Defense uses a 9-technique Defensive End on the strong side. Squeeze and spill, Block Down – Step Down… call it what you want. That guy aligns outside shade of the Tight End. When there’s no TE, he’s outside shade of the Tackle. One of the beauties of the defense is simplicity for the Front 4. All 4 positions are the same. Align outside shade. Attack. Squeeze. Spill. One of the defining differences between the 4-3 Defense and the 4-2-5 Defense is that DE being inside or outside the Tight End. With the TE off the field, they have very little distinction. This is not unsound defense, though. You can play it. I just want to split that hair. The 4-3 Defense has a 2-Gap Mike Linebacker. He has to be a 2-gap player BECAUSE OF MATH. In a 2 TE Formation, there are 8 gaps. 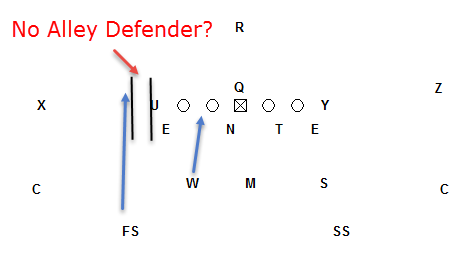 Your force player needs to have someone inside of him in the D Gap. Otherwise, he’s forcing it back to no one. 7 man fronts (4 + 3 = 7) must have that 2 gap player. And teaching that skill is not the hardest thing in the world. It is actually very natural. But it is a must. While we’re on the subject. If you walk your Will Linebacker inside and make him a B Gap defender on runs to the weak side, you’re not in a 4-3 Defense. Or not in a sound defense. One or the other. You pick. If we have 2 TE’s, you either have no force player, or no alley player. Not sound. The only way to fix it is to have your Will play the weak side D gap. Which means on weak side runs, no one has B gap. Unless you have the Mike do it…. wait, that’s a 2 gap Mike Linebacker. Who should be aligned behind the Nose, splitting the difference between his 2 gaps. You that you can call your defense anything you want. We’re just going to have a hard time communicating about it. And that’s OK because you don’t coach me. You coach your kids. If you can communicate it to them, and they buy into it, that’s what matters. But there are better ways. OK, done with my old man “the way it should” be rant. Now GET OFF MY LAWN! If you want to get all the details about the 4-3 Defense front 7, the way it should be, download my eBook Installing Football’s 4-3 Over Defensive Front to get your feet wet. Then stick around. I’ll be opening up the 4-3 Defense eCourse for new enrollment soon.